I can’t remember the last time I worked out in a hotel gym. I’d rather explore the places we travel than sweat it out in a closed space that may or may not have windows and a view. I have a theory, in fact, that the fitness centers in hotels and resorts – free for the enjoyment of all guests – are the most underused gyms of all. Think about it: when was the last time you saw a crowded hotel gym? It’s ironic, then, now that I need a gym — per doctor’s orders, running is not recommended for this week and next — I don’t have access to one. We’re staying at a condo, rented from its owner directly (we found the place last year via HomeAway.com). It’s much more affordable than hotels, especially for families who need two bedrooms or more. You also have a kitchen, so you don’t have to eat out all the time, a washer-dryer, a proper dining room… heck, this place is about twice the size of our apartment in Manhattan. But there are things you must give up, like daily housekeeping services – i.e. you will make your own bed, wash your towels and clean your kitchen. So I’ve had to improvise. I researched my options the day before we left and found out that – surprise! 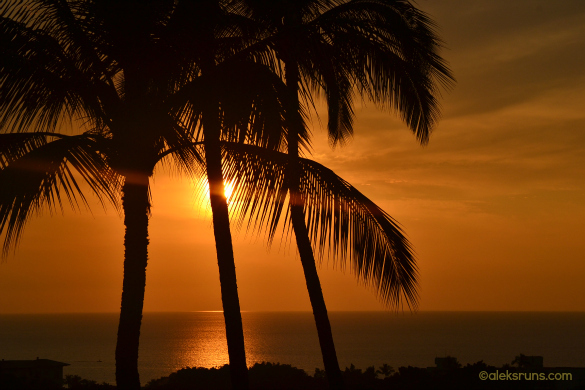 – there aren’t very many fitness centers in Maui. I found only two gyms within a five-mile radius (there were a couple more, but they were 30+ miles away: a 45-minute or longer drive), so they would have to do. Lucky for me, they do seem to get a fair amount – or most? – of their business from visitors. 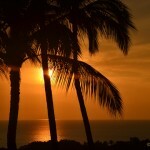 One – Maui Powerhouse Gym – offers a 1-day free pass; then costs $20/ day or $70/ week. The other has a five-day pass. It doesn’t list prices online, so I don’t know the costs yet. I used up my the Maui Powerhouse Gym freebie today and plan to hang out at Valley Isle Fitness Center for five days next week. I’m sure they offer daily/ weekly passes as well, so I’ll just go with whichever I like more for the rest of our vacation. In fact, if we were here for only a week, I’d have been able to get by on free passes alone! Note: if you don’t have access to a hotel gym while traveling, definitely check out free trials at nearby facilities! At Maui Powerhouse Gym: it wasn’t crowded-crowded, but there were definitely more people working out than I expected. I guess I shouldn’t be surprised, given the temperatures outside (already in the 80s at 9 a.m.) and the humidity. Still, to the several people running on treadmills: really? You think that’s more enjoyable than running by the beach? I did 30 minutes on the elliptical and 30 minutes on a bike; sweated out about three buckets of sweat (gross) and realized that pedometers are really inaccurate when it comes to measuring distance on activities other than walking. Shock. 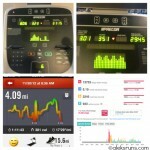 Moral of the story: if you have to substitute runs with cross training, go by time rather than miles. 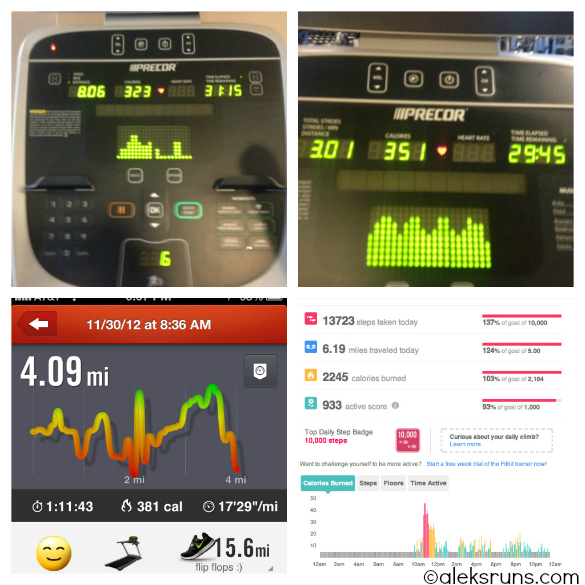 If you have to run four miles and you’re stuck with an elliptical machine, for example, just go at it as long as it normally takes you to run four miles. Doh. Having sweated so much, I drank lots of water all day. 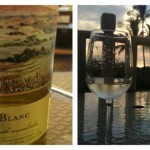 Then around 5 p.m., it was time to hydrate properly, with this made-in-Maui pineapple wine. Now, I am no oenophile, so I will spare you all the tutti-fruity, smokey-oakey, hint of mint (ash?) details. I didn’t get any of that. 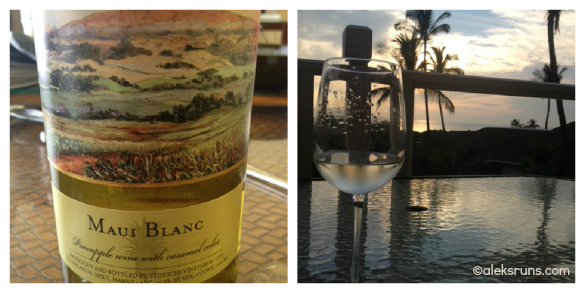 But I definitely smelled pineapple and was thoroughly refreshed by the glass… er, three glasses, I had while enjoying the sunset and eating dinner. And seeing how they grow the pineapples and make the wine right under our noses, tomorrow’s road trip has been planned.